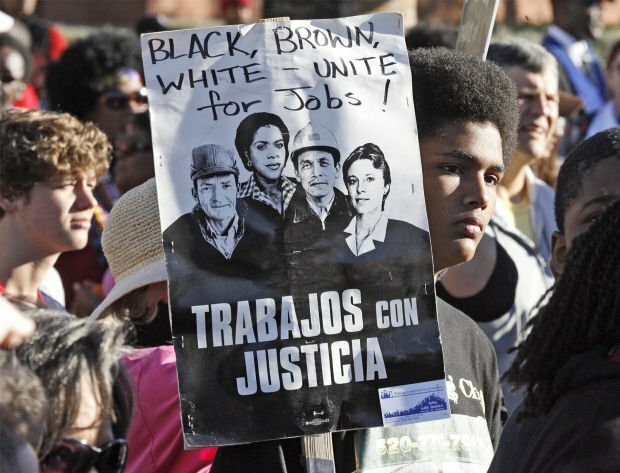 In this January 2014 file photo, Walter Holloway, holds a sign for unity on the UA Mall before a march to commemorate Martin Luther King Day in Tucson. After the three-mile walk to Reid Park Monday, the MLK celebration continued at the DeMeester Outdoor Performance Center. Tucson street named for Martin Luther King Jr.
On Monday, Tucson celebrates Martin Luther King Jr. Day with a city street named after the civil-rights leader. 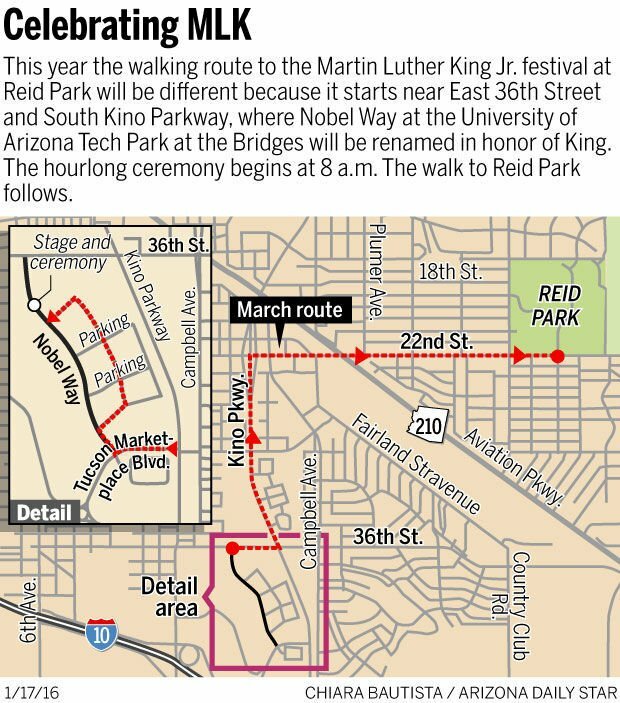 Nobel Way, in the UA Tech Park at the Bridges, near East 36th Street and South Kino Parkway, will be renamed to ML King Jr. Way at an 8 a.m. ceremony, kicking off holiday festivities. An annual walk begins from the new location, starting after the ceremony and ending at Reid Park. The event also marks the end of Tucson’s time on the short list of U.S. cities without a street named for King. “It was something that we saw a need for here in the Tucson area ... We wanted it done for what Dr. King stands for, which is civil rights, peace for all, and there was nothing like that to show his existence here in Tucson,” said Doris Snowden, president of the NAACP Tucson chapter. It was chapter members who approached Tech Parks Arizona about renaming a street in the Bridges development after King. King Day was not an official state holiday in Arizona until 1993. Phoenix named a portion of its Broadway Road for King only last year, and 2010 Census Bureau statistics place African-Americans at only 5 percent of the Tucson population. “Struggles for social justice and equality have been an important part of Tucson’s history,” said Bruce Wright, spokesperson for the UA Tech Park and associate vice president of Tech Parks Arizona. The project encompassing Heritage Path is called the Pathway to Discovery. ML King Jr. Way will be the main thoroughfare of the Heritage Path portion and will employ interactive kiosks to “highlight and celebrate the cultural diversity and history of our community,” Wright said. He hopes to see Heritage Path complete within two years. Annie Sykes, one of the NAACP members who approached Tech Park, says the UA’s involvement, and that they own the street, made the name change possible. Even so, Sykes said the process took almost two years. “When we moved to Tucson in ’59 it was still segregated.” Snowden says. “The swimming pools, the movie houses, we had to sit upstairs at the Fox Fairmount. But Snowden still sees room for improvement, citing the lack of African-American businesses in the area as an example. Big band Snarky Puppy, Monterey Jazz Festival On Tour will perform. More Info: The annual MLK Walk commences from the ceremony site. The new route turns right onto 36th Street to Kino Parkway, then north to 22nd Street, ending at Reid Park. Festivities at Reid Park include music, performances and food vendors until 3 p.m.
Made comments about Phoenix TV reporter.